Dubai, UAE, January 21, 2019: Many of the world's top golfers, including OMEGA brand ambassadors Tommy Fleetwood and 2017's winner Sergio Garcia, are set to tee off at this year's OMEGA Dubai Desert Classic at the Emirates Golf Club. Dubbed the ‘Major of the Middle East', the tournament begins on the renowned Majlis Course on Thursday January 24th and continues until Sunday January 27th. For more than 25 years, the tournament has been a celebration of golfing excellence and OMEGA is proud to have served as title sponsor since 2010. 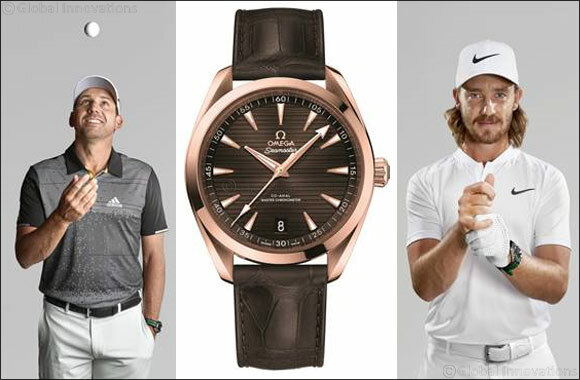 OMEGA's title sponsorship of leading golf tournaments has been a part of the luxury brand's dedication to the game. It is committed to upholding the elegance and mastery of golf, while also helping to encourage its global growth and appeal. Along with the championship trophy and cheque, the winner of the OMEGA Dubai Desert Classic 2018 will be presented with a luxurious OMEGA Seamaster Aqua Terra. The watch is an elegant timepiece that embodies a visionary design and sophisticated air. Presented on a brown leather strap, the symmetrical 41mm case has been created in 18k Sedna Gold and features brown sun-brushed dial distinguished by horizontal “teak” pattern, inspired by wooden decks of luxury sailboats. Other stunning features include 18k Sedna gold hands and indexes filled with white Super-LumiNova, and a date window positioned at 6 o'clock. The timepiece is powered by OMEGA Master Chronometer Calibre 8901, certified at the industry's highest level by the Swiss Federal institute of Metrology (METAS). Any golfer, who, with incredible precision and just a bit of luck, scores the first hole-in-one on the 7th hole at the OMEGA Dubai Desert Classic, will be rewarded with an OMEGA Seamaster Aqua Terra 150M. The stunning 41 mm wristwatch in 18k Sedna gold and stainless steel features a silvery dial and horizontal “teak” pattern. Equipped with OMEGA's revolutionary Co-Axial Master Chronometer calibre 8900, a high standard of quality that is perfectly suited to a player unrivalled accuracy.